With custom wall clocks, it's always time for customers to see your brand name! The practicality of this generous corporate gift allows you to maximize your brand’s exposure with minimal effort. We can customize any item to include your logo or artwork. Whether you're looking for a funky, contemporary design or a more traditional clock, ePromos will make sure your message reads as clear as the hour. Promotional items such as these give your business the face time it deserves! Full Color Slim Custom Wall Clocks - 12"
By imprinting these Full Color Slim Custom Wall Clocks with your logo, you're not only ordering an awesome promotional product, you're also ordering a solidly constructed and stylish office decorating piece! Translucent Promotional Wall Clocks - 10"
10" lightweight analog promotional wall clocks with translucent frame. Full Color Grande Logo Wall Clock - 14"
Use the power of color on this logo wall clock to promote your company. Full Color Brushed Metal Custom Wall Clock - 10"
Use the power of color on this brushed metal custom wall clock to promote your company. Full Color Brushed Metal Custom Wall Clock - 14"
An artistic and unique promotional wall clock fashioned after the original "Will-Return" shop sign. Full Color Economy Oversized Logo Wall Clock - 12"
Full Color Economy Logo Wall Clock - 10"
Your clients and employees will love to see the time go by with personalized wall clocks from your company! Imagine having your business logo and message right in front of everyone's eyes in offices, meeting rooms or even in their homes. Branding a custom clock is the perfect way to keep your branding in the forefront of your audience’s minds. Let ePromos help you choose the perfect clock to help elevate your brand. We carry options to fit any budget from low to high priced options. Imprinted wall clocks make great keepsakes for retirements, milestones, achievements or holiday gifts. 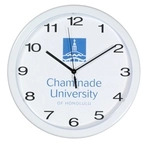 Let your promotional clock become the focal point of any room. Take a look through our selection of options featuring plastic, metal or glass materials. Our analog wall clocks feature different eye catching details. Our options with big bold numbers are great for easy time telling glances, or look through some of our stylish options with dashes to mark the time. Whether you’re looking for a custom clock face, a personalized photo or engraved wall clock, we have you covered. Make sure your logo stands out with either screen printing or full color process options. Show your employees or clients how much you value their time by gifting them with a custom clock for your wall today. Ask a brand consultant about which option will best suit your brand and budget today.